While I was in St.George this past weekend I asked G-Ma Roam to teach me how to crochet because there were some headbands that I saw on TV that I wanted to make. At first it was kind of tricky because I just couldn't seem to get it started out right with the whole wrapping the yarn around and bringing it through and stuff. I finally got it down and they were not as hard to make as I thought they would be. Mine could definitely use a little more work until they are perfect but at least I can do it. G-Ma Hannig also helped me a little bit with how to hold the hook and such. It took me a long to to get the hang of how to hold it but after awhile it got pretty comfortable. Now I just crochet my life away in my free time. All my roommates call me Grandma, but I don't care. It gives me something to do! 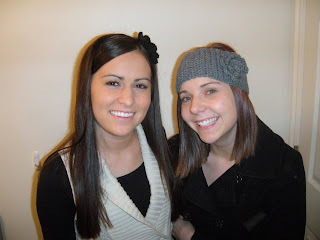 Here is an awful picture of kara and me wearing the headbands G-ma Roam and I made. Oh my! I am impressed. Make Quinnie and Avery some Beanies with those cute flowers on them! I have wanted them to have those forever!!!!! Sell em! You can make some money on the side!